The stem has a spreading, branching structure, bending abruptly at a sharp angle. It roots at its nodes. The leaves are linear, hairy, and turn dark-red or maroon as they mature. There are plenty of leaves near the base of the plant and scattered loosely along the stem. The flower head is finger-like and is composed of 4-6 thin spikes. It can produce as many as 150,000 seeds. The weed is very similar to large crabgrass except that the node does not have roots and the leaves do not have hairs. The flower head is composed of 2-6 spikes. 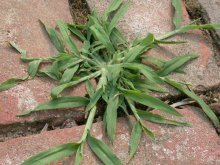 Large crabgrass competes directly for soil nutrients and moisture. It can reduce corn yield by 20%. It is an alternate host for leaf blast, mosaic virus, and nematodes. The infected weed becomes the source of infestation in the following cropping season (Rice IPM, 2001). Studies show that the weed is found to be resistant to Fluazifop-p-butyl, Haloxyfop-methyl, and Imazethapyr on onion and vegetables growing in some parts of Australia; to Atrazine on corn fields and orchards in some parts of France and Poland; and to Fluazifop-p-butyl, and Sethoxydim on carrot and onion farms in some parts of Wisconsin, USA (Weed Science, 2005).